Renal failure can be caused by many conditions including diabetes. When the time comes that a person’s kidney function falls to a level that requires dialysis (blood filtration) your Renal Physician will refer you for creation of a fistula. 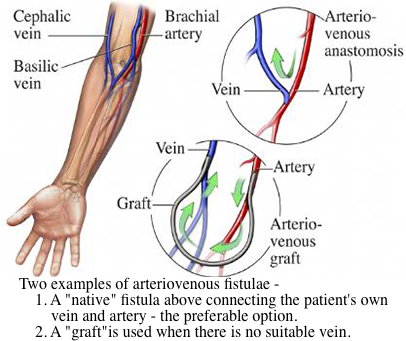 A fistula – more correctly known as an Arterio-venous Fistula (AV Fistula) – is created by connecting a vein in the arm onto an artery within the arm, which then allows a large volume of blood to flow through the vein close to the skin which can be accessed easily for dialysis. This is a small procedure and can be highly successful in allowing long-term dialysis access. Dr. Hansen has a wealth of experience in the creation and managment of AV Fistulae. Each year he travels to Samoa as part of the Orchid Charity Group, to create dialysis fistulae for the Samoan population. For more information on Renal/Dialysis Access call now!